Treasury has floated the idea of forcing agriculture to be included in the Emissions Trading Scheme (ETS). It has raised the possibility of obliging farmers to join other businesses in paying for their carbon emissions in a briefing paper it prepared for Finance Minister Bill English, and Associate Finance Ministers Steven Joyce and Paula Bennett on March 18. The paper focuses on the economic implications of removing the one-for-two subsidy, which allows some businesses to pay one emissions unit for every two tonnes of pollution they emit. Climate Change Minister Paula Bennett in this year’s Budget (announced on May 26) said the subsidy would be phased out over three years. The Treasury paper recognises this will reduce the “fiscal risk to the Crown presented by the stockpile of around 140 million New Zealand Units (NZU) held in private accounts, which could be carried over into the 2020s and used by ETS participants to meet their surrender obligations. “As these NZUs cannot be used by the Government to meet its 2030 climate change target, the Government may be required to purchase eligible international units to do so. “This represents a fiscal risk, the size of which will depend on carbon prices in the 2020s. At a carbon price range of $25-$50, this would be $3.8-$7.5 billion over 2021-2030,” Treasury says. Furthermore, Bennett says removing the subsidy will add another $356 million to the government’s books over the next four years, based on a New Zealand Unit price of $12. Treasury says that even with the subsidy removed, there will still be a stockpile of 32-51 million units, which at a carbon price of $25, represents a “fiscal risk of $0.8-$1.3 billion over 2021-2030”. To address this, it recommends the government seek advice on “placing surrender obligations on the agriculture sector”, among two other options. Treasury does not go on to analyse its suggestion for the government to consider including agriculture in the scheme, but admits this has “significant downsides”. Radio New Zealand reports Morgan Foundation general manager Geoff Simmons saying it is only a matter of time before the government will have to do something about agriculture. "If we don't take action on agriculture and free allocation then the whole entire rest of the economy has to be carbon neutral by 2030, now obviously that isn't going to happen so I think the government is waking up to the realisation that because of these two risks we are going to have to take action on agriculture." Yet Federated Farmers isn’t having a bar of the suggestion. Its climate spokesperson Anders Crofoot told RNZ the ETS was a blunt tool and making agriculture part of the scheme would make New Zealand farmers less competitive internationally. He said New Zealand farmers were efficient producers - meaning they emit less greenhouse gases for the amount they produce. Furthermore, if New Zealand's trading partners were doing something similar, farmers would be more accepting of being part of the ETS. Crofoot also told RNZ methane and nitrous oxide, predominantly from agriculture, needed to be treated differently from carbon dioxide. Late last year then-Climate Change Issues Minister Tim Groser said the Government had begun a review of the ETS, but the full inclusion of agriculture "remains off the table at present." ETS have only ever been financial scams that achieve nothing in terms of actual emissions reductions but help to create the perception the government is concerned about the state of environment in the future [when in practice it is not]. This latest initiative is just more 'fiddling while Rome burns'. Come to think of it, it's far worse than 'fiddling while Rome burns', since the NZ government is actively 'throwing gasoline onto the fire' via its growth, consumerism, transport and tourism policies etc., and adjustments to ETS will achieve less than nothing. Of course, with respect to abrupt climate change, the most dire consequences of the continuing politics of failure won't manifest for another decade or two, when atmospheric CO2 will get into the 450 ppm to 500 ppm range. Bet the young sharemilkers will.love this robbery, if the price of these units goes on the rampage I dont think I would want to be involved in farming. 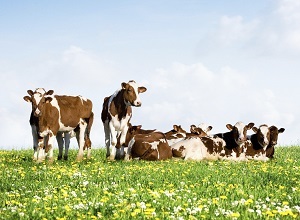 Dairy cows ruminate more than beef...? Good timing Treasury. Bright sparks they are. Isnt the rbnz in panic mode right now to save farming. Perhaps they want to see NZ a tree farm. Mmm thats cashflow right there. Perhaps treasury govt and rbnz should have woken up years ago as farmers were allowed to borrow up large to buy their neighbours and convert. Noooo you couldnt restrict borrowing thats anti capitalist. You cant tell a bloke he can only own one farm...greed is good. Now sort it fellas...good luck with the mess.